Latios has moved on to new locales, and now Latias has taken its place atop Gyms in the Americas and Africa. It'll be available only until June 5, 2018, so don't delay. Trainers in Europe and Asia will instead encounter Latios. Latias and Latios can be caught only with the Premier Balls you earn from defeating them, so you'll need your Pokémon to perform well in battle to maximize your chances. You can participate in Raid Battles even if you're not high-level or if your Pokémon aren't the strongest, but you'll have an easier time if you prepare. Check out our guide to training Pokémon in Pokémon GO to get tips on strengthening your team, and then read on. 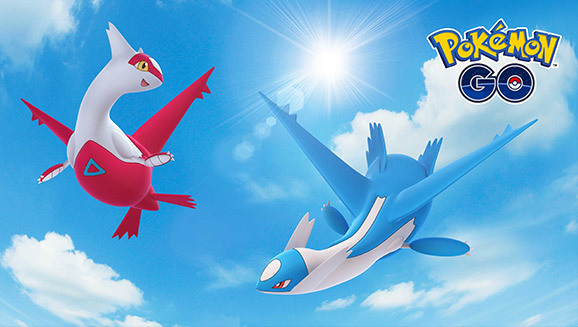 Latias and Latios are Dragon- and Psychic-type Pokémon, so you'll be able to battle both of them using similar Pokémon. Both are weak to Ice-, Bug-, Ghost-, Dragon-, Dark-, and Fairy-type attacks. They aren't doubly vulnerable to any type, so you should tailor your team based on the high-CP Pokémon you have available from these types. Stay away from Fire-, Water-, Grass-, Electric-, Fighting-, and Psychic-type attacks, as they'll deal reduced damage to Latias and Latios. If you've put in the effort to train the mighty Dragonite, Tyranitar, or Salamence, it'll pay dividends in these encounters. These Pokémon deal massive damage with their high stats and their Dragon- and Dark-type moves. Rayquaza is another great choice if you were able to capture and train one, while the strongest Dark-type Pokémon for this encounter after Tyranitar is the elusive Absol. There are few powerful Ghost-type and Ice-type Pokémon available, but some are fantastic for this encounter. If you trained Ice-type Pokémon like Cloyster, Jynx, Lapras, Articuno, or Walrein to battle Groudon or Rayquaza, they'll be solid contributors once again. Options for Ghost-type Pokémon are more limited—only the frail Gengar is particularly adept at dealing heavy damage. Latias and Latios will struggle to take down some other Psychic-type Pokémon. The stout Lugia can deal solid damage over a long period if it knows Dragon Tail, the Dragon-type Fast Attack. Mewtwo's Fast Attacks won't deal much damage, but its Shadow Ball is devastating enough to justify its selection. Gardevoir's Fast Attacks won't fare any better, but it'll be great on defense as a Fairy- and Psychic-type Pokémon, and its Dazzling Gleam will be overwhelming. Steel-type Pokémon resist both Dragon- and Psychic-type attacks, so they're great on defense in this encounter. Unfortunately, only a few will deal enough damage to help maximize your Premier Ball rewards. Scizor is the Steel-type star because of powerful Bug-type attacks like Fury Cutter and X-Scissor. A Metagross that knows only Steel-type attacks is very solid, but its damage output is middling. You won't get many Premier Balls to catch Latias or Latios once you've defeated them, so make your throws count. Before each throw, use a Golden Razz Berry, being sure to stock up on them beforehand by defeating other Raid Bosses. The odds of capturing a Pokémon are greatest while the target ring is at a small enough diameter to score Nice, Great, or Excellent Throws, and throwing Curveballs can improve your chances further. But work within your abilities—if you don't think you can hit Excellent Curveballs reliably, aim for Nice or Great Throws rather than risk missing the target ring completely. You may waste your Premier Balls if your target is moving around when you throw them. Wait for it to start acting up and for the target ring to disappear while it's a size you're comfortable throwing into, then time your throw so that the Premier Ball lands as the target ring reappears. Legendary Pokémon are tough to catch, so don't be discouraged if you don't catch your quarry. Stock up on useful items like Max Potions and Max Revives, and try again later. Good luck with your Legendary Pokémon adventures, and remember to check back at Pokemon.com/Strategy for more Pokémon GO, video game, and Pokémon TCG tips.